"Management Systems For The Woodworking Industry"
New Zealand Designs and Materials. The Timber Component Machining Module in conjunction with Woodman Production instantly calculates parametric machining points for mortises, router slots, drill holes and tenon sizes for each component in the production job. Varying machining points for parts such as colonial bars and predetermined variables such as door mid rail heights, variable rail widths, narrow meeting stiles etc. are automatically accommodated to produce a unique set of machining instructions for each component. The Timber Component Machining Module can automatically generate programs for CNC machines such as the Masterwood OMB1CN3KF CNCmortiser/router, Celaschi CNC mortise and tenoners and Homag Woodwop programs. If required,up to FOUR CNC programs with an unlimited parameter list can be attached to each component. This enables CNC devices to be linked as part of a production line process, allowing for auto-reversal of the parts lists. For example, the first part off the stack into the tenoner would be the last part off the stack going into the mortiser. The Timber Component Machining Module produces a detailed machinist’s report showing finished lengths, shoulder dimensions, tenon lengths, mortise positions and dimensions for each component. Any number of jobs can be batched into one machining list. 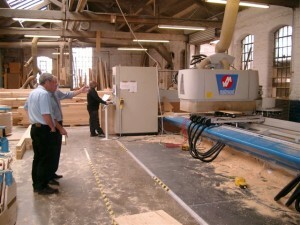 This is the ‘must have’ software for any timber joinery machine shop.